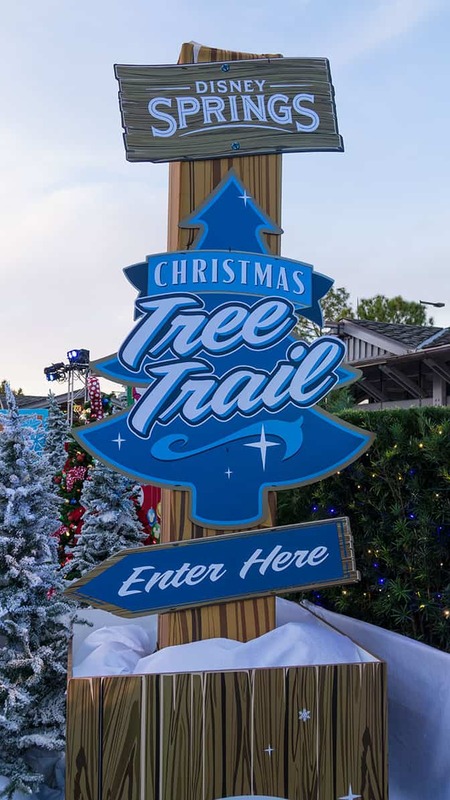 Debbie and I made our way over to Disney Springs on November 11 to check out the new “Christmas Tree Trail” at Disney Springs. We’ve compiled over 70 photos that includes every tree both during the daytime at night. I’ll include some viewing tips in the article as well. Let’s get started! 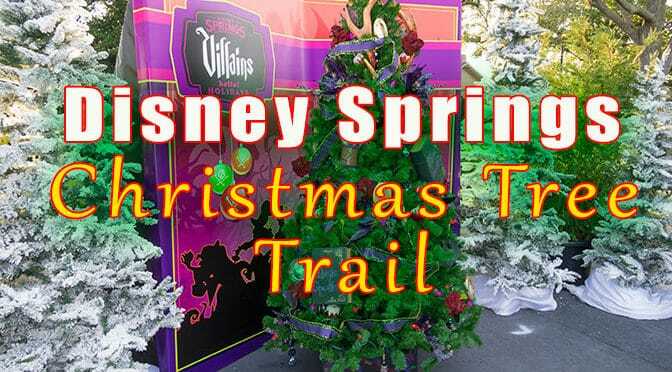 The Christmas Tree Trail is located on the far end of Disney Springs near the Once Upon a Toy store and close to the Rainforest Cafe. 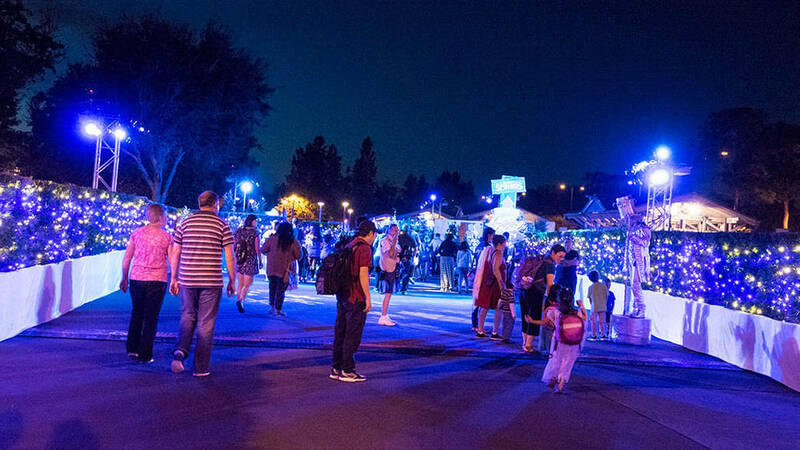 It’s in the area that used to be the Disney bus stop area before it moved to Town Center. We entered the tree trail the first time around 5:00pm so we could get a nice view of the details of every tree. It was still daylight and they were testing the “Mickey Snow” machines. That meant we had to be careful with the camera lens so it doesn’t get soap all over it. 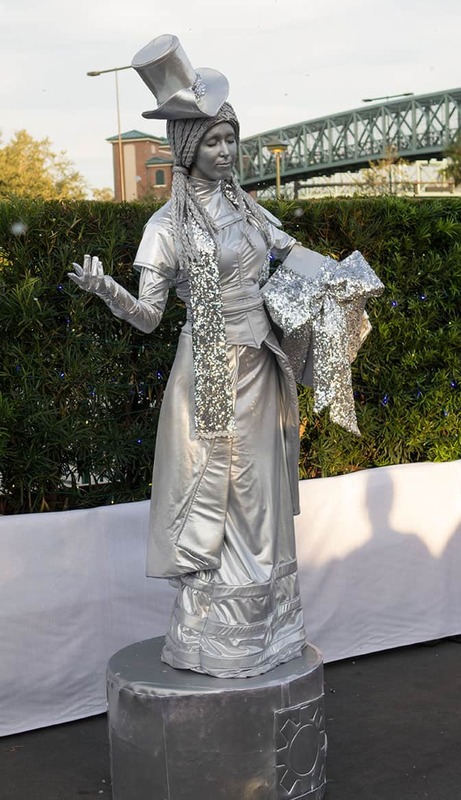 As we entered, we found the “Living Statues” performing at the entrance area. There was a female performer and a male one. They often look very serene, then when you get ready to snap a photo with them, they will make a silly face. 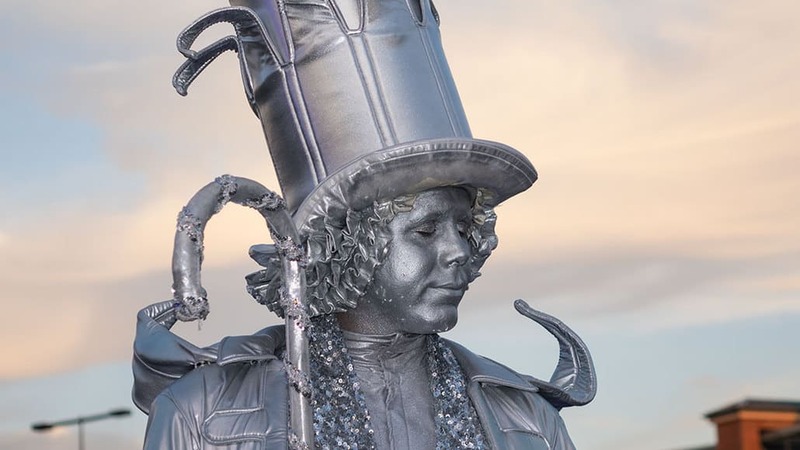 Sort of a Mad Hatter meets the Tin Man approach I suppose. He’s really talented though. There’s no way I could stand motionless for minutes at a time. Oh wait, I stood in line for Sandy Claws earlier in the week, didn’t I? 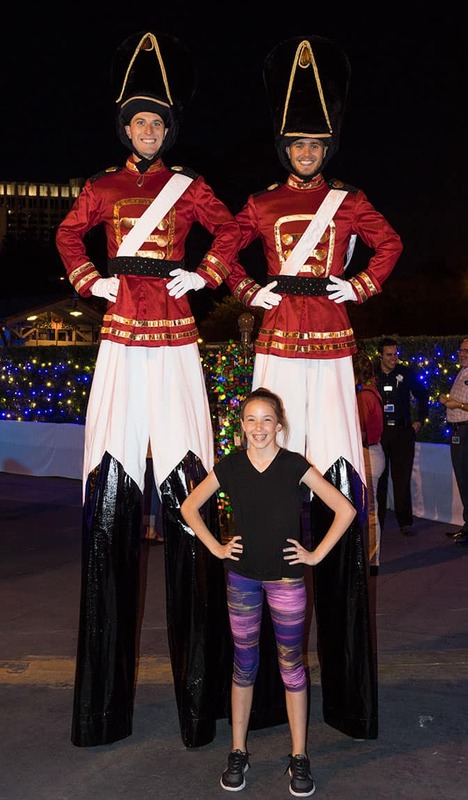 If you enter the Tree Trail after 6pm, you’ll find these super tall Toy Soldier guys at the entrance, so you can snap a photo. Use flash, it’s really dark. Here’s what the entrance looks like at dark. It was the first night and early in the evening, so it wasn’t very crowded. Parking lots were pretty full when we prepared to leave around 7pm though, so use Disney transport or plan to arrive 4 to 5pm. 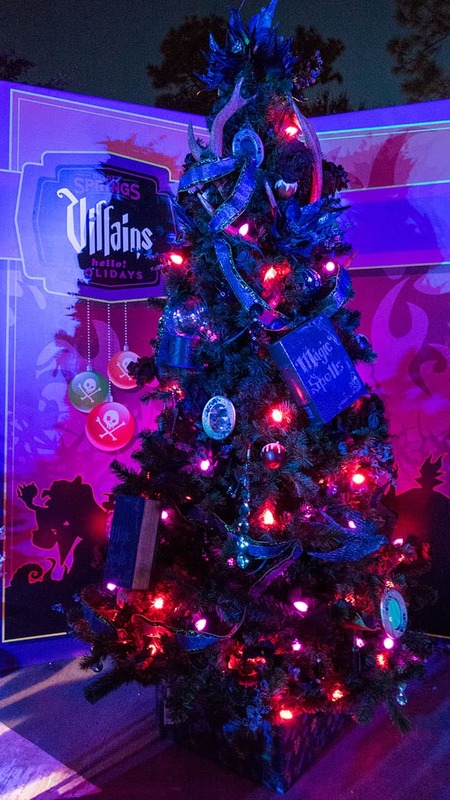 The first themed Christmas Tree you come to is the Villains tree on your left. It’s nice to see the villains represented as they seem to be a smaller and smaller part of the Disney experience these days. 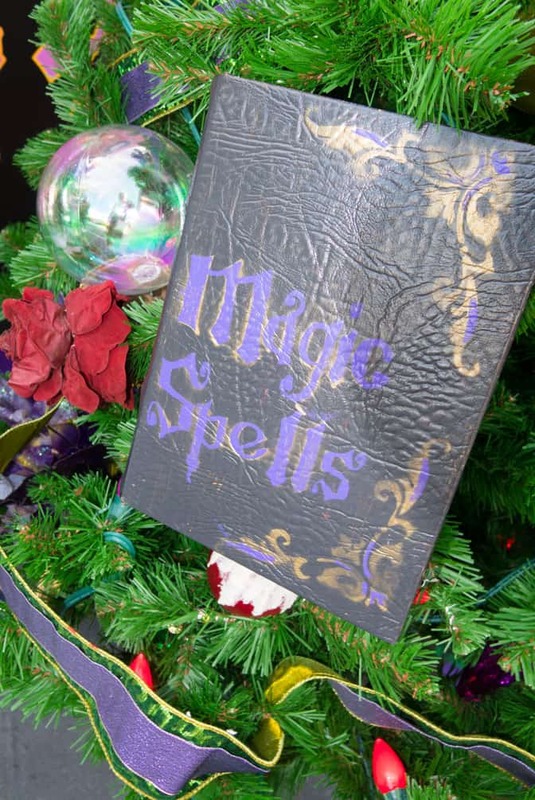 The tree is filled with many bewitching details like magic spells books and crystal balls. 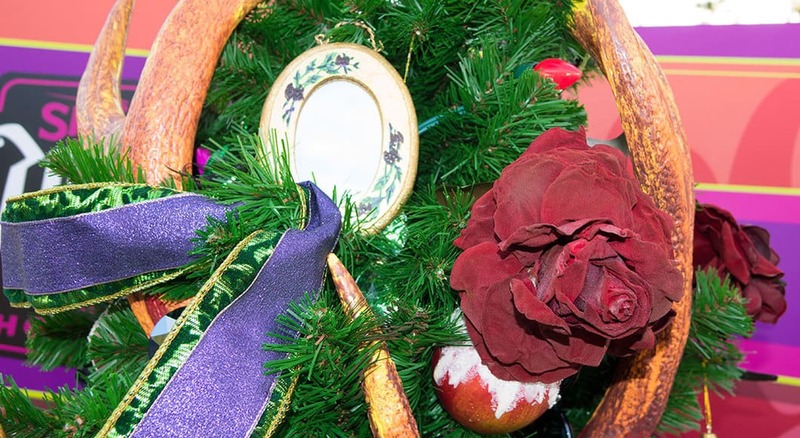 Of course you’ll find antlers for Gaston, a magic mirror the poison apple and many other small details. Debbie wanted to feel included in the experience more, so she took the camera from me and began shooting photos. Most of the photos you’ll find here are Debbie’s photos. 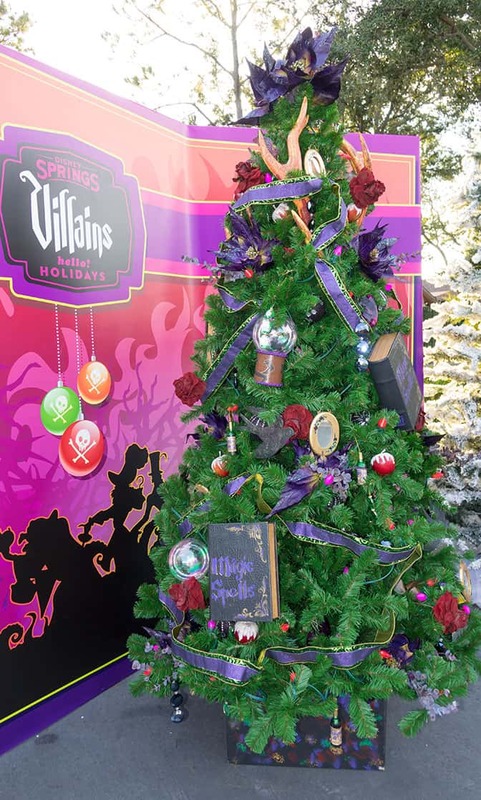 Here’s the same villains tree after dark. 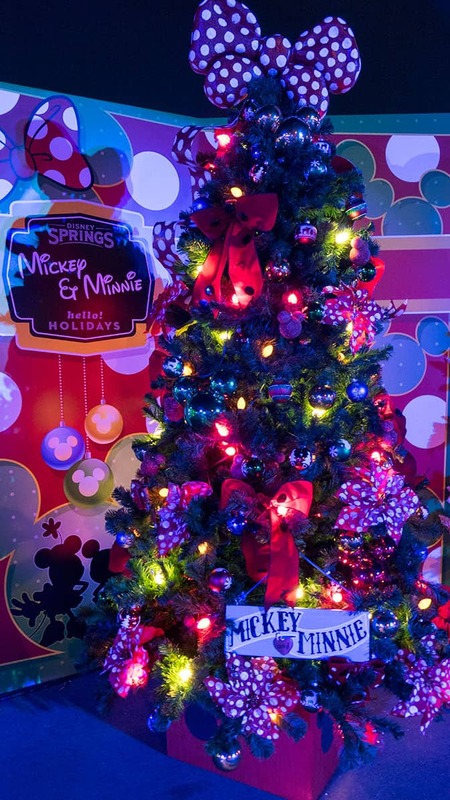 Across from the Villains tree is one that Mickey and Minnie have decorated for your enjoyment. 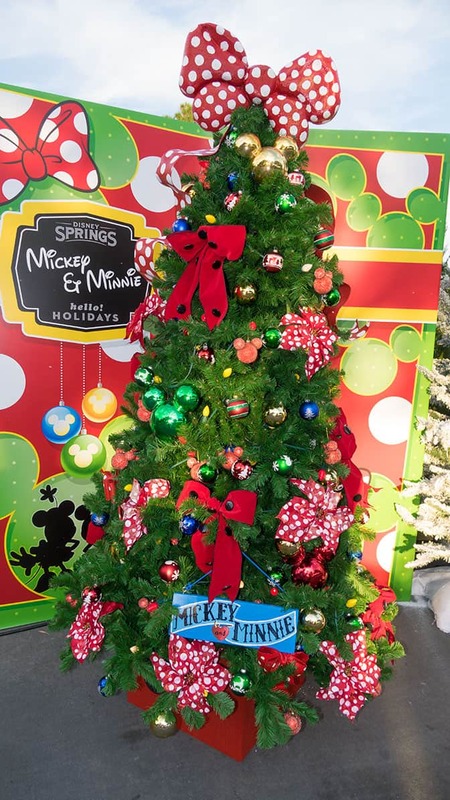 Debbie loved the Mickey heads for ornaments, but felt the tree was lacking other tips that are unique like the yellow shoes for example. 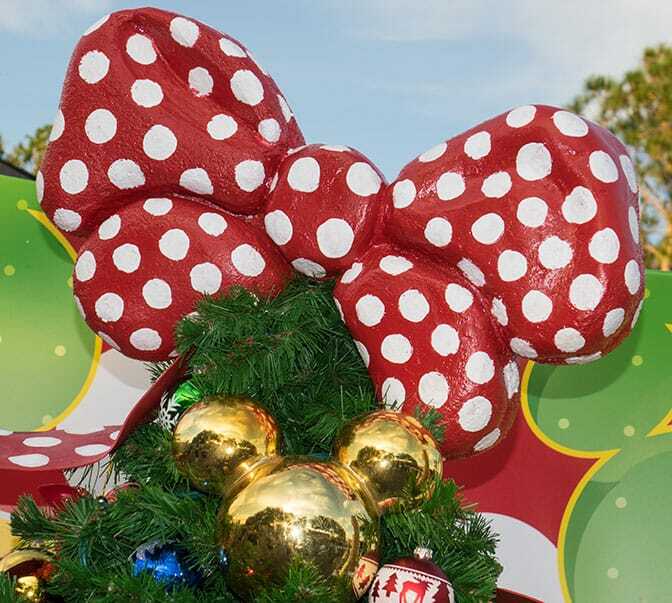 She loved Minnie’s bow on the top of the tree. Do they sell this somewhere? 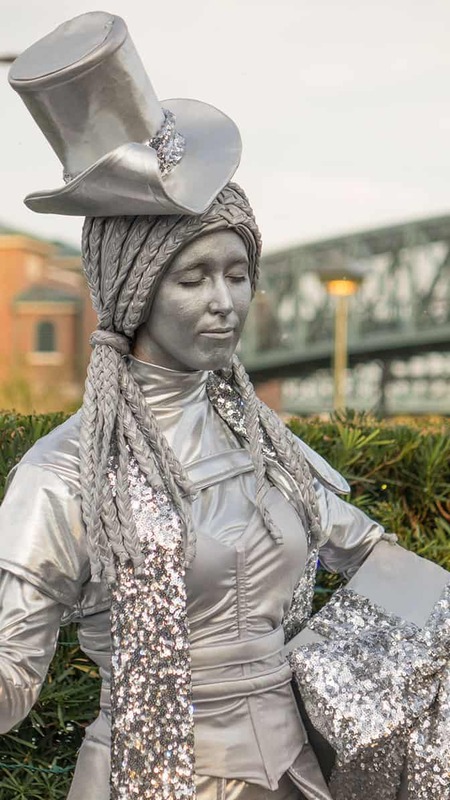 We were using a Sony RX10m2 which allows us a good deal of light into the camera at F2.8, but the photos still came out a bit dark and I had to tinker with them a little to be able to see more than just a dark blue photo. Continue to page 2 below! Excited to visit here when we have dinner at Ragland Road! How long is this display up for? We arrive on the 30th of December. Where is this set up? We have only explored the new part briefly – is it on the old side or new side? You guys do such a wonderful job! I love the photos! Thanks for sharing! 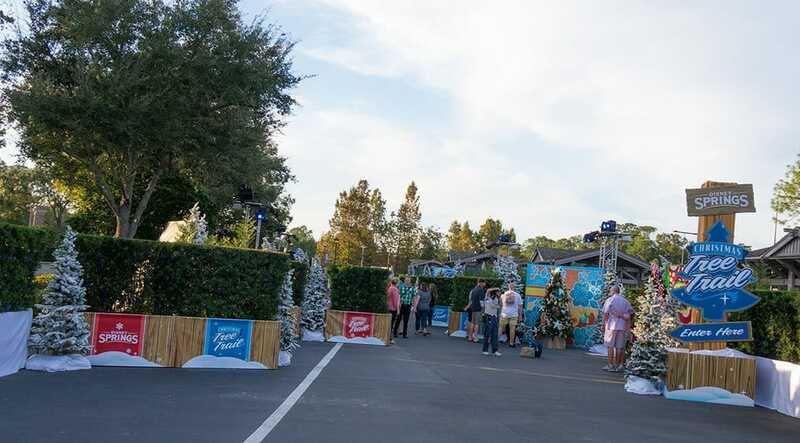 Do they have photo pass photographers for each tree? If so are they there day and night? I didn’t see any photopass photographers when I was there. Is there a shop that sells ornaments like the ones on the tree? I saw several that would look really cute on my tree. 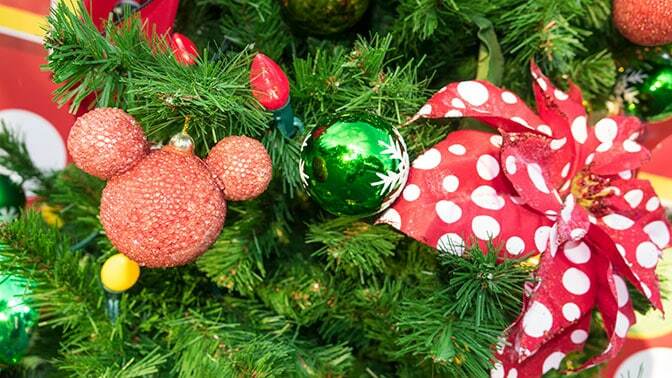 The Disney Christmas shop is at the exit of the trail, but I can’t confirm for you what ornaments they may have. Thanks for letting us experience through your eyes! We have a similar thing in Indianapolis and we really enjoyed it last year. Of course, they aren’t Disney themed, but one tree was last year, so you never know. I believe this will become a very popular “free” thing to do during the holiday season! Thanks again and Happy Holidays! Thank you so much, great to see since we won’t be down this Christmas time.